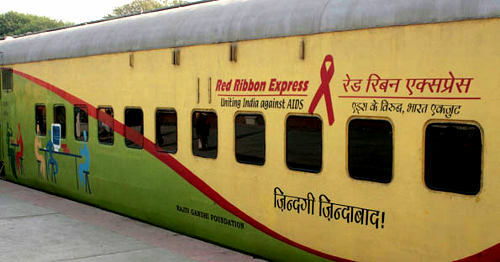 The Red Ribbon Express, a special train which travels across the country to spread awareness on HIV/AIDS will arrive at Belgaum on April 2, 2012 and will be here until April 4 at the Belgaum Railway Station. It has three exhibition coaches with exhibits on HIV and AIDS while the fourth coach on the National Rural Health Mission (NRHM) has exhibits on tuberculosis, malaria, reproductive and child health services, general health and hygiene. Specially designed coaches are with displays on bio-medical aspects of HIV and AIDS including interactive touch screens and 3-D models, educational material with focus on stigma and discrimination free communities, information on general health, hygiene and communicable diseases.